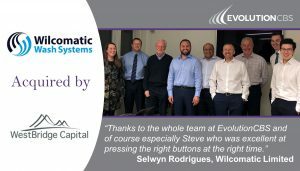 In a deal led by Reading based M&A Advisors EvolutionCBS, a majority shareholding in Wilcomatic Limited, one of the UK’s leading providers of vehicle and rail wash systems, has been acquired by WestBridge Capital. Established in 1967, Wilcomatic supplies and supports vehicle wash systems to petrol forecourts and has contracts with all the UK’s major supermarket chains. Additionally, Wilcomatic is developing a strong presence in the UK commercial and international rail markets, supplying rail wash systems to rail depots in the UK and overseas. The business is widely viewed as a market leader in its niche sector. WestBridge Capital is an award-winning private equity house that invests in established and ambitious UK companies with the potential to grow faster. As well as acquiring the majority shareholding in Wilcomatic, WestBridge has provided growth capital to support the company’s plans to double its estate (currently at 3,000 machines in the market) over the next 3 years. Lead adviser EvolutionCBS secures $25m investment for Rimilia. Another successful deal for EvolutionCBS as Teaching Art is acquired by PHD Equity.